HABIT: Yellowish green flowers on tall stalks after ten years or so. Some species have pinkish white flowers. 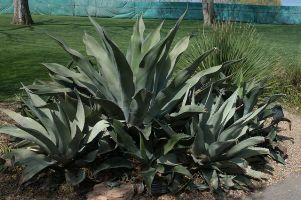 Most agaves form a rosette of thick, leathery, yellow-green leaves. Agave americana, the century plant, has blue green leaves up to 6’ long with hooked spines along the edges and a wicked spine at the tip. Several varieties have yellow or white striped leaves. More than 300 species exist. CULTURE: Dry, well-drained soil is the best situation. USES: Specimen for dramatic look and texture change. PROBLEMS: Coarse texture, sharp spines, hard to work around, dangerous. Very slow growing but tough and beautiful agave. Excellent for the cactus garden or in pots. Plant in full sun with extremly well drained soil. Very east to grow with a few pest problems. Stupid people carving their initials into the leaves is the most common problem. Hardy to 12 degrees F.
GROWTH: Slow growing sucullent variegated leaves in rosettes to 18" in diameter. NOTE: Be careful. It is highly armed. ANSWER: I would cut the stalk off now and hang it upside down for a month or so to allow it to dry thoroughly. It should last a long time as a dried flower. No other treatment should be needed.